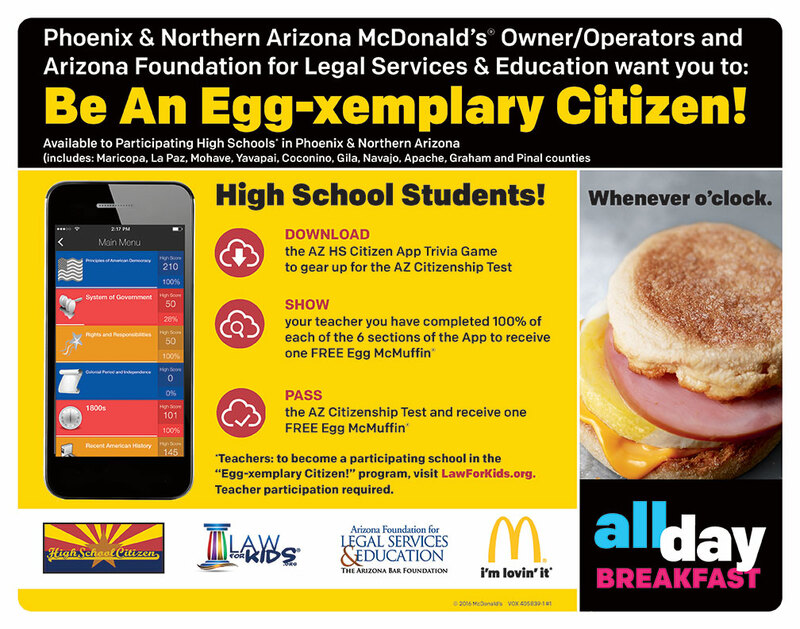 Phoenix and northern Arizona McDonald’s restaurants and Arizona Foundation for Legal & Education Services (AZBarFDN) are teaming up to launch “Be An Egg-xemplary Citizen” reward program and AZ HS Citizen trivia app to help students pass the mandatory Arizona Citizenship Test. 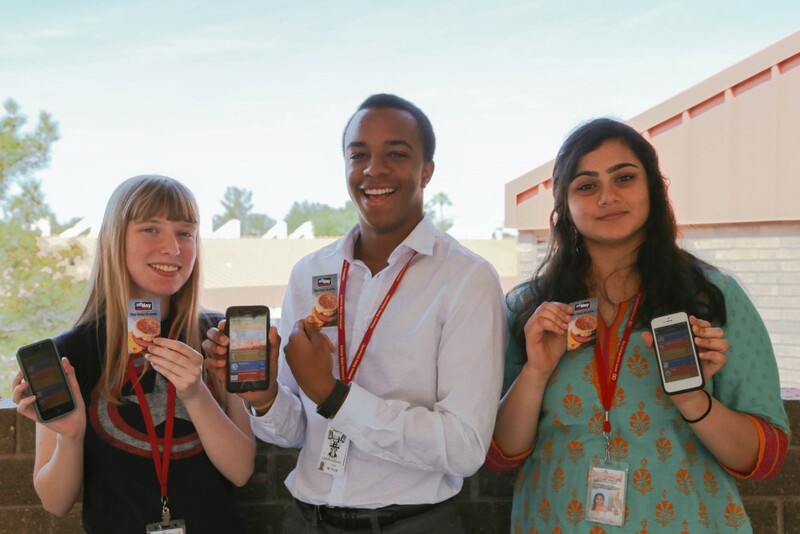 Participating high school students download the free AZ HS Citizen App from the Apple App Store on their iPhone or school iPad, show they have completed the six-section quiz to their teacher and receive a coupon for a free Egg McMuffin®, complements of McDonald’s. Participating students that “pass” the Arizona Citizenship Test will also receive a coupon for a free Egg McMuffin. The AZBarFDN has also developed a lesson plan for Arizona teachers to introduce the AZ HS Citizen App to 8th – 12th grade students. 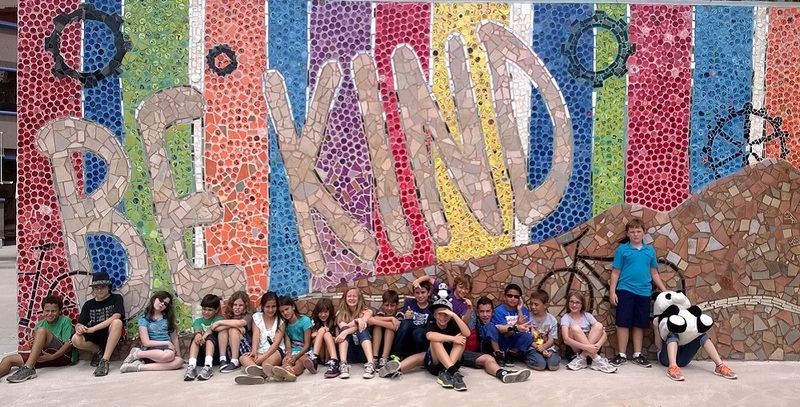 To participate in the “Be An Egg-xemplary Citizen” program, teachers must sign up on AZBarFDN’s website, LawforKids.org. 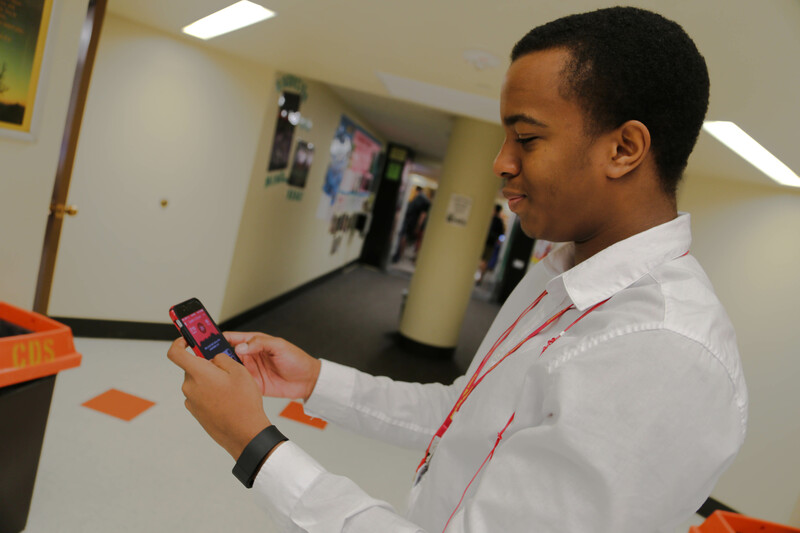 The AZ HS Citizen app was designed by 16-year-old Primavera Online High School student Riley Danler, with help from his father. 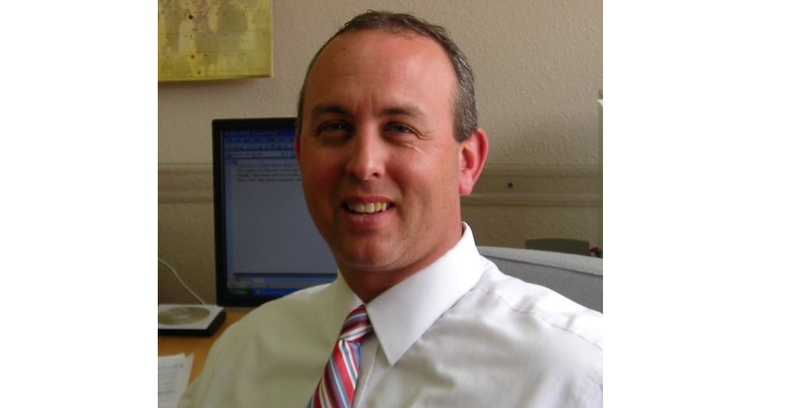 Danler, grandson of AZBarFDN executive director Dr. Kevin Ruegg, developed the app after she expressed a need to help Arizona students pass the Arizona Citizenship Test. “I am so grateful and proud of my grandson! I am also so grateful to McDonalds for incentivizing students to learn about the very important role of citizenship.” stated Dr. Ruegg. For more information and to participate in the “Be An Egg-xemplary Citizen” program, visit LawforKids.org. The State Bar of Arizona created the Arizona Foundation for Legal Services & Education as a separate 501(c) 3 organization in 1978, charging it with the mission of promoting access to justice for all Arizonans. The Foundation strives to fulfill this mission by preparing Arizona youth for civic responsibility and providing access to justice for Arizonan’s most in need. Through the provision of technical and financial assistance to probation & resource officers, teachers & administrators, private attorneys & judges, and legal service attorneys & advocates, the Foundation works to level the playing field, so that all in Arizona have knowledge and access to the justice system. To find out more, visit http://www.azflse.org. Our 300 Arizona McDonald’s restaurants employ more than 15,000* people. We make good food that is served fast, with a focus on responsible sourcing. 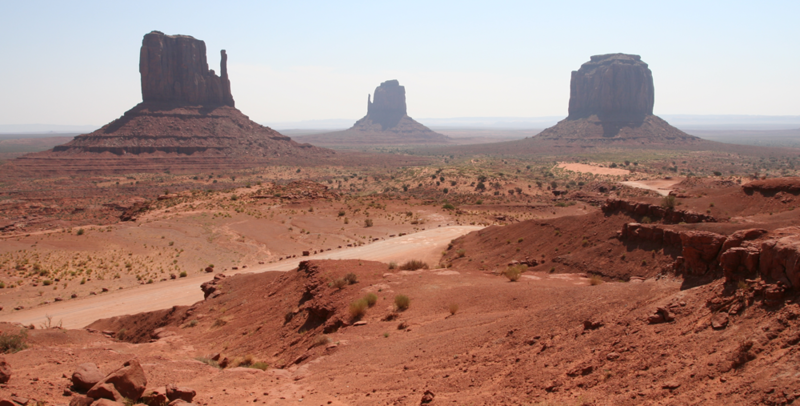 Our McDonald’s supply chain includes suppliers of all sizes including family-owned farms and ranches in Arizona. In 2014, McDonald’s spent more than $49.7 million on locally sourced food, purchasing 28.9 million pounds of lettuce, 8.2 million pounds of flour and 16.6 million pounds of beef. *McDonald’s and McDonald’s independently owned and operated franchisees are equal opportunity employers committed to a diverse and inclusive workforce. McDonald’s and each of McDonald’s independently owned and operated franchisees are the exclusive employer of their employees and as such are solely responsible for all employment related matters in their restaurants.